when Adji and Minou got together... just a bunch of kids of 22 and 23 years at the time. 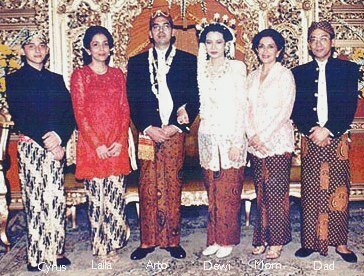 From left to right at Arto & Dewi's Javanese wedding. Cyrus Agung, Laila Minouwati Ari, Sidharto (Arto) Reza and Dewi. (Arto's wife, the sweetest person any in-laws could have) and Minou and Adji, the Iranian & Javanese factories that made the first three. Cyrus* ... that's the name of the Persian king, and Agung stands for great ... you know ... Cyrus the Great ... He hasn't done anything great yet, maybe one day ... (his 25th. birthday is on Nov. 9th. 1998). Laila that's a Middle Eastern name, and Minouwati a combination of Minou's name and a typical Javanese name Wati. And Ari that's the female version of Adji. Laila is after-all a combination of two far-away cultures and nations. She was, what one would call during those days in the '60s a love child ... made in the romantic city of Paris (on somebody's army cot). We just wanted her, and to hell with everything else. (She'll be 33, also on Nov. 9th ... Cyrus shares her birthdate). Sidharto's name was given by Arto's grand paw after the great religious leader Buddha. Arto's nickname stands for money in Javanese. We hope one day he'll become filthy rich. Name wise, Arto's fell in place real nice. And Reza, well... that came from Minou's great granddad. He was born 10 months after Laila (he'll be 32 Sept. 29th.) The parents produced real fast--like bunny rabbits. ... the guy on the right of the wedding foto, Raden Adji Suryo-di-Puro, decided that he wanted to have a family with this gorgeous young woman, Minou Fatemeh Mahdavi, an Iranian princess from the Kahdjar Dynasty from her Mother's side, obviously with her consent. That's the lady on the second right of the wedding foto. Minou means paradise. Fatemeh is a typical middle eastern name and Mahdavi is an old venerable Persian name of Persian landlords during the Kahdjar and Pahlavi Dynasties. Mind you, he was only 23 and she was just 22 then! 'Raden' stands for something like ... prince in Javanese, perhaps Lord in England and Sultan somewhere else. Suryo-di-Puro stands for "city of the sun", suryo means sun or light, puro means home or place, and di is "of the ...". This Raden is a descendant of the Central Java King, Raden Mas Said, or King Mangku Negara the 1st., translated roughly to mean "who holds the nation on his lap" (known locally as MN I who, in turn, was descended from one of the Wali Songo, the Nine Religious Leaders, who in the early 11th. century brought the Islam religion to Indonesia, instrumental in making Indonesia's 210 million nation the largest Moslem country [but not an Islamic state] in the world) from his Dad's side, Raden Mas Suyoto Suryo-di-Puro. King Raden Mas Said ruled several hundred years ago as Prince "Samber Nyowo", the soul taker, because of his supernatural and legendary ability to kill his enemies, the Dutch, (sorry about that Dutch folks, it was a long time ago). Legend says he did that without laying a hand on them - and without using weapons - by just observing rows of soldiers at a distance, extending his hands and taking a swipe and wrenching the souls of his enemies. He was also known as Prince "Sapu Jagat", the universal sweeper, because of his ability to clean corruption and anything else that was dirty (also supernaturally) during his reign. And this was the beginning of Minou and Adji's life adventures ... This guy Adji first started by holding a job as a n insurance broker at one of Lloyds' London underwriting houses in 1964, then as an English language journalist in three of the well-known news agencies in London, Paris and then Germany. His gorgeous young companion whom he discovered in a London party went with him everywhere -- still unmarried and without her Mom's knowledge ofcourse (it was important those days, especially for young Iranian women), even to the extent of asking Minou's friends to send her pre-written letters and post cards to Mom in Tehran from England while she was elsewhere in Europe with lover boy. (Left foto 1965 when Minou was pregnant with Laila). While working as a journalist he accepted to take on a job as an “operative”, that's the kind of fellas in the James Bond movies who go around those days making trouble for communist governments, except this was not a movie. We won't go into details on how and why that started. Suffice it to say that the 30-year non-disclosure and confidentiality time limit was over in 1994. So, as an operative this guy in 1964 was chosen because he was the "most unlikely person" to be an agent. They had to throw out the book on operative qualifications, and start fresh because they could not solve a particular problem which resulted in 3 failed missions. So, Adji became the first of a new breed. He was not big (only 5.7"), looked too young for his age ... (he looked 15 at that time, like Cyrus in the wedding foto above) all in all “a most unlikely person” to be a field operative. Those operatives are usually big, 6 feet at least, and looked real macho ... and did macho things. No earrings or long hair because it wasn't the 'in' thing yet during the mid '60s. Besides, long hair was just an unnecessary risk in hand to hand combat because no one plays by gentlemen's rules (none of that nonsense to give the other guy a chance – for example, a typical police style warning shot in the air; just shoot him in the back of his head, if needed, to get on with the job) when an operative's bible was to dispatch his enemy once without a second chance, Steven Seagal style (who is a real Asian martial arts, Japanese Aikido practitioner, in this case using the adversary's offensive energies to disable him). Not like in the kungfu movies (blocking the adversary's efforts, as versus utilizing the adversary's efforts) where the adversary gets up again after being hit 10 times with a hammer. Martial arts in the '60s were still a rarity, even scoffed at, in modern western society, but thousand years old stuff in the Far East, and one didn't break beer bottles with the side of the hand, like the 1¼ inch scar that remained on Adji’s right little finger a result of a wrong practice session. (See also how a modern Javanese martial arts practitioner can dispatch his enemies without even touching them). Anyway, it wasn't a good idea to tangle with this guy whether one is a big 300 pounder or not, especially not when this guy's fists can go through a cemented brick wall and demolish someone's skull (at that time anyway. Now, 34 years later, one can say he's a softy, and none of this stuff of being able to break beer bottles with the side of his hands any longer). This guy... well he kinda looked like a wimp ... compared to the other operatives. Except for looks and physical attributes, this wimp was capable of doing anything those other guys could do (otherwise he couldn't have been one of them) like being dropped in a strange country, adjust to the situation, not know who his enemies were on the streets, nor talk the language, or know the geographical makeup but still capable of doing a job like kidnapping (and other things) without causing any waves (the important part in being an operative), make do and survive with what's at hand, except the enemy is not in uniform and one can't tell, and the battlefield is an unfamiliar town in an unfamiliar country. In east Germany during the communist regime, the "enemy" could be just ordinary folks -- housewives, older men & women, youngsters who, under normal circumstances, would never become an "informant" to provide information that may become useful to communists, and rat on one's friends, and even brothers and sisters if it comes to that. If these "part time informants" provided useful information to the communist regimes, it goes a long way to get one of their east German relatives – especially a brother, sister or mother or father – still in east Germany to west Germany. Becoming one, whether part time or permanently, therefore, was mostly because of necessity in a desperate east German's effort to survive. The target's strategy, specifically the east Germans in this mission, was its "cultural attributes", and these were important for Adji's particular job because three previous kidnappings attempts failed. And those attributes were the German people in general, and the east Germans in particular, were a stickler for regulations, were exact, were disciplined and followed the rules to the letter -- whatever rules they may be. For example, an east German could be standing in front of a red pedestrian traffic light in a small town, absolutely no traffic (and no cops), not even a bicycle, nothing, and he would just wait there until his light turned green. Couple it with a strict, no-nonsense, "follow-the-rule-or-otherwise..." dogma drilled by the east German communists which probably included being thrown in jail for going against a pedestrian light, and there you have the ingredients that formed their strategy. And this attribute was what was used to get this particular job done, not the usual put a bullet in the brain and blow the place to kingdom come hit and run tactics of the film world. The fourth attempt had to be "extra quiet", no waves.. nothing and this fella filled the bill of being the most unlikely person to be an operative.. which worked. The west Germans one could say were pretty happy-go-lucky compared to the east Germans (at that time) who were pretty somber, suspicious of everybody, and downright unfriendly asking "for papers" every 500 feet. From recruitment, training, and setting up strategies all was undercover obviously, because nobody knew. Except one day 5 months in (out of 6) ... this gorgeous companion Minou discovered these guys' plans because people who love each other stick to each other like glue and she was bound to discover it. "I want to go, too," she demanded. "No way!" the others chorused together. "Either I go, or your Dad will hear about this." Besides, Adji was over 18 years, was therefore not entitled to a diplomatic passport, and Indonesia had a phobia about communists and was in no particular hurry to recognize the east German regime. And Indonesia certainly did not approve of their citizens entering somebody's country to make trouble where they could not help because of non-existing country representation ... especially his Dad being a senior diplomat. Very embarrassing -- caught between a rock and a very hard place -- if something happened to the son. So, as nearly all mission preparations were "go", so ... o.k. you can come, but ... the "buts" included she was a part of the backup crew with 4 other guys in different cars; she may not come near or be with Adji in public, must pretend she did not know him in Paris (where they had to get special equipment), Koln (where their vehicles came from), Bonn (for some other thing) and Berlin (east & west where they had to go through practice runs). Adji had to be completely alone in continental Europe, especially in west Germany because the commies had spies all over (again informants who are common everyday folks whose relatives are still in east Germany and were willing to cooperate with the communists in return for freedom of their relatives still in east Germany); absolutely no public consorting with known operatives including Adji's own team, no companions, and especially no women companions because '15-year' olds did not have women companions in hotel rooms (remember, this was in the mid-'60s). This guy had to be as completely anonymous and low profile as possible. Except for his brown skin, Asian features and all, he couldn't be more conspicuous as a black eye in the middle of those German blondes. This conspicuousness, the impression of aloneness of a lost soul, was used considering that travel to the "iron curtain" as the communists were called then, was not like traveling to Hawaii or Bali for a vacation. It was plainly a place nobody, except another fellow communist, wanted to go to. So after a lot of "bargaining" and "demands" (which lasted pretty much throughout their later lives because Adji pretty much let her have her way), one being she wanted to be in the hotel room with Adji when "nobody was looking", they agreed. Come to think of it, the team had not much choice either, considering the circumstances. Anyway, after 6 months preparation for this specific mission Adji's team successfully smuggled out this east German woman scientist from East Berlin capping a successful 4th. mission The east Germans (through the prodding of the Russians) didn't throw her in a cell on her first three attempts because they needed her. Other escapees would get 20 years hard labour, the standard punishment. But as she was important to them, so she was pretty free to do what she wanted as long as it was in east Berlin. Adji told Minou in a hotel room after it was all over in Wolfsburg, (the west German Volkswagen manufacturing town near the east German border), "Iam having the shivers" (cold chills running up and down his spine which he didn't have during the 6 days doing the job ... this guy was human after all), when remembering how the dry runs between west to east Germany, and dry runs between west to east Berlin and east to west Berlin failed miserably; how Minou got lost in East Berlin because she was all shook up because the east German border guards were hassling her and giving her a hard time (why go out to be mean to a young woman); how Adji, as planned, was observing this scientist from 10 tables away identified as a woman "using a brown coat with a flower on her lapel" at the Metro Cafe in east Berlin and watching 2 armed soldiers eyeing this woman in a crowd of at least 200 or more people (they were watching her to make sure she didn't try to bolt again--not the soldiers who were there to be seen and to be obvious), when suddenly Minou who was not supposed to be there at all from out of the blue comes stumbling to his table which he shared with two men (who Adji figured could be east German informants as far as he was concerned), trembling and sobbing tears from her big dark brown eyes recounting how she got lost for 2 hours all by herself in east Berlin because border guards forcibly separated her from the rest of the crew because she had a different passport, and how she just wandered the dark numbing cold streets of east Berlin, her hands nearly frost bitten (she left her gloves in the car) until by chance she remembered hearing the "Metro Cafe" near the train station from one of the team, and to heck with everything else ... mission or no mission. So he dropped all pretense of not knowing anybody in east Berlin, comforted and held her; then back to west Berlin where a dry run also failed (Adji again alone) but this time making sure Minou didn't get separated from her companions, and then remembering how the Berlin plan was abandoned and another plan executed, which meant more hassles, involving traveling all the way to Leipzig in east German territory from east Berlin because it was timed to coincide with the Leipzig Fair in case something went wrong (which it did) where Leipzigers there looked suspiciously at every stranger as if he had done something wrong. Well, he was going to do something wrong anyway. The scientist lady in the meanwhile had to invent some excuse to leave east Berlin for Leipzig. Then remembering how the backup team arrived 2 hours late just before the completion of the mission because it was imperative the woman had to be taken before 6 p.m., otherwise the guards who were on duty at night were usually smarter and that meant smart enemies just won't do; how the team had to leave East German territory first before Adji could leave, but because they were late (that was not a good example of German efficiency -- well, Germans are not infallible) stranding Adji and his scientist in East Germany. The team had to leave east Germany first, so if the backup equipment didn't work and Adji got caught, he can openly admit he intended to kidnap this woman, admit had a support team because no '15-year' old had sophisticated equipment (there's no point lying about something obvious), and they are welcome to catch them if they could which they couldn't ofcourse because, he thought, they had left the country. Which they hadn't. Adji didn't believe in going through this torture and confession rubbish if he got caught. It was a waste of energy on both sides, but Minou was the achilles heel if they got caught. Then there was the blizzard at 6 p.m. that slowed down all mission activities just when it was being carried out (it was a freezing March), then Adji getting lost in the woods; thinking the scientist had died seeing her lying unconscious on the snow and he had to revive her (that's another story); then he was nearly shot in east Germany by some stupid jerk guard (they were all over the place, even in the middle of a small village) who didn't speak English. "So, I spoke Indonesian," he told her. "Better for this jerk to get confused, rather than speak German and then have to explain all kinds of things in German." All these afterthoughts going through Adji's head after it was all over caused most of the cold shivers. Throughout their lives afterwards, if Adji and Minou was facing a problem and he was not around her, all he thought was her well being, not so much the problem (34 years is, after all, a long time and one is bound to have a few problems now and then). Anyway, life went on, and in the mid '70s this scientist become an American citizen a (west) German fellow operative and support team head, Horst P. said (left foto our second get together in Hong Kong Hyatt's Cin-Cin bar in 1994). It's a good thing you were not caught, he reminded, you would have been either shot, or spent 20 years in hard labor. Horst, after leaving his former employer later worked for a well-known German tire manufacturing company in Hong Kong as its representative in the mid '70s, till he decided to go off on his own. Adji never got the chance to ask him whether his rep job was truly a genuine job, or one of those undercover things to spy against the mainland Chinese because China (at that time) was a very closed society and was ripe for being spied on (which Adji knows Horst will answer truthfully). He's now wealthy, owns a majority share and president of publicly-listed telecom manufacturing companies in New York, Hong Kong and Canadian stock exchanges, but is no longer muscular and has a tummy (and is even bigger), and thinks nothing of regularly losing every 2 or three months his new BMW 750s to Chinese smugglers who steal luxury cars in Hong Kong to sell to mainland China. His goal was to be "very rich" and he achieved it. As a middle aged 50-plus man he still drives like a madman, jumping into the opposite lane against traffic if his lane was jammed -- like he used to do in London. Everybody, operatives or not, have now become bald, fattish and just plain run down. Horst's state of mind, and of others in the team though was the same as before (that is their mental capabilities -- sharpened even more by years of useful experience -- can do such jobs again) but they can't physically carry it through. Well ... that's life. Now that East Germany doesn't exist ... Adji doesn't worry whether he will be arrested if he goes to East Germany. Before East Germany broke up, it was too risky to return (even as a news agency journalist who was usually allowed to enter places where common folks usually fear to tread), and was warned never to return because he stuck out like a sore thumb and easily recognizable (there were not too many Asian operatives in Europe), just as he stuck out like a sore thumb in Moscow. A few years later in 1970 the East Germans complained to the embassy in London, knew Adji's identity, and Germans being pretty thorough, knew how Adji did it. (Dad had left London sometime ago). Indonesian Ambassador to England Air Marshal (4-star Air Force general) Rusmin Nuryadin told Adji in 1972 without a hello or any greeting, except: "...so, you're the trouble maker?" when he walked into his office for a visit after arriving from Jakarta. "What trouble? I just flew in from Jakarta, just arrived from Heathrow (London airport), took the taxi to the Embassy. That's it. I didn't do anything! " "There's this report about your adventures in east Germany ..." , he continued, pointing to some papers on his desk. "But that was in the mid '60s," Adji said. (Right driver's license foto, late 60s early 70s). "I didn't think they'd discover it." Apparently they did, and complained about it which is silly because a government would normally never admit they had one done on them. It must have really hurt them. But they can file all the complaints they want. After east Germany ceased to exist in 1990/91 it became irrelevant anyway. Adji hopes wherever this lady of science is in the States, she will always remember him, did the things she was freed for, and hope she's having a good life. He feels he did his bit for the German people in their decades long struggle for unity. Perhaps, if by some very remote chance this lady visits this homepage and remembers, she would drop Adji a "Hi, how are you?" note. After adventuring all over Europe (as a journalist), Germany was Adji & Minou's first home together after east Berlin, and was the birthplace of Minou and Adji's first two babies Laila and Arto when he transferred to Koln from Paris as news editor for a foreign news agency--not realizing, then in cold east Berlin, that he would one day return again to Germany with Minou to create a family. I guess one can say Germany repaid Adji's efforts because Germany was kind to them. (Right foto Arto and Laila 1967 Germany. Lower left foto, Cyrus*, 11 months born in Jakarta, with his nurse and Mom). Reflecting back, imagine New York, London, Tokyo or Jakarta totally and completely surrounded by a wall ringing the whole city and split in half down its middle by another 5 meter high concrete wall that not even a cat could crawl through, watched over by overlapping machine gun towers every several hundred meters throughout the city -- through streets, woods & parks, through buildings, through the underground railways -- ready to shoot at anything that moved including rabbits, like a large scale city prison ... just couldn't get over the arrogance of those communists dictating how and where one lived. It's difficult to describe it. One has to be physically there, to feel and breathe the suppression and fear of those poor east Germans. Imagine reading a book on how to fly an airplane, and then without any experience actually sit in the pilot seat, the first time, and then try to fly that plane because there is no choice but to fly it (no choice but to live there). That is the kind of fear a suppressed citizen feels, that doubt whether one will land that plane safely and make it (whether one can live freely) or not. When east Germany broke up, Adji and Minou were living in Jakarta and watched its breakup and the dismantling of the Berlin wall on satellite TV with their grownup children. Adji wondered what they were going to do to those east Germans "officials" who did not really have to shoot and unnecessarily kill wounded east Germans trying to escape. The “human rights” and “war criminal” attitude was not yet as strong as it is now in the ‘90s. Adji had his views on it, but it's not nice to express it. “ ..I hope you continue your road map.. ” www.iGrandparents.com – the web's largest site on grandparenting: “I looked at your site (it was excellent) ... I hope you continue to design your great site and continue your road map! * Have a good day.” ... Bryan Butakis www.iGrandparents.com• *Road map is a reference on real-life experience, the "how-to" of handling the devastation and bereavement of losing one's child, and the psychic and physical “After Death Communications” found in several webpages at the www.suryo.net site map. Start life with someone you can spend hours talking – about anything. Physical attributes (and physical attraction) come second ... they go away in time. When you can communicate – and because of it understand each other, you will avoid misunderstandings, fights and boredom ... then “Life Together” after 38 years can become a reality ... and is worth it. This Life-Connection Website site is owned by www.suryo.net|| Join Ring | Previous 5 Sites | Previous|| Next | Next 5 Sites | Random Site | List Sites | What's a Ring? – A poem: God said: "I'll lend you my Child..."
– A friend Asks: Tell me about Cyrus? – What Do the Other Dimensions & “After Death Communications” Convey? • Why Do We Have Different Beliefs? Because of Conditioning? • Are you a Persian? The beige background of the menu on the left comes from the "batik" motif or "bahan titik", an acronym which means material made from dots, the process of making handmade batik cloth. Do you have a website with these themes below? Your experiences may help and give others pointers. Link to this and 26 of our other sites and ours to yours? Converter: mph-kmh, lbs-kgs, ft-m, vol.torque, temp. etc. "Ask Our Personal Shopper" it will help you find exactly what you're looking for.